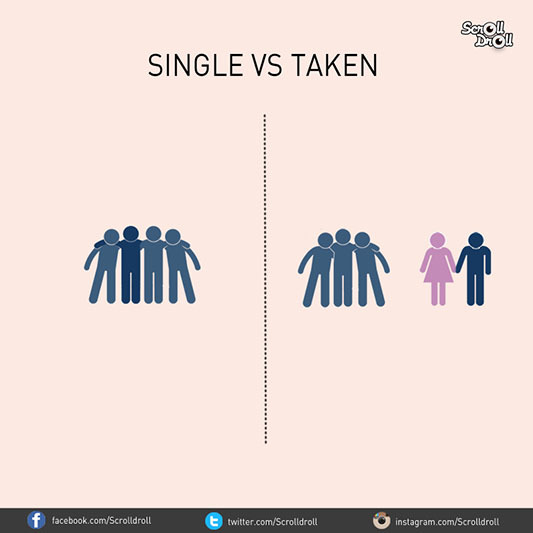 There are two kinds of men in this world – one who enjoy the freedom of being single and others who are willingly held in the clutches of a relationship. And while you may think that a relationship doesn’t define anybody’s life, it kinda does. 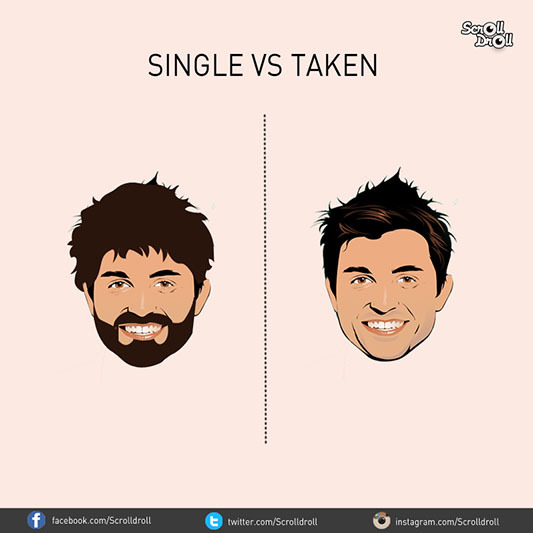 There is a stark difference between the lives of single and committed guys. 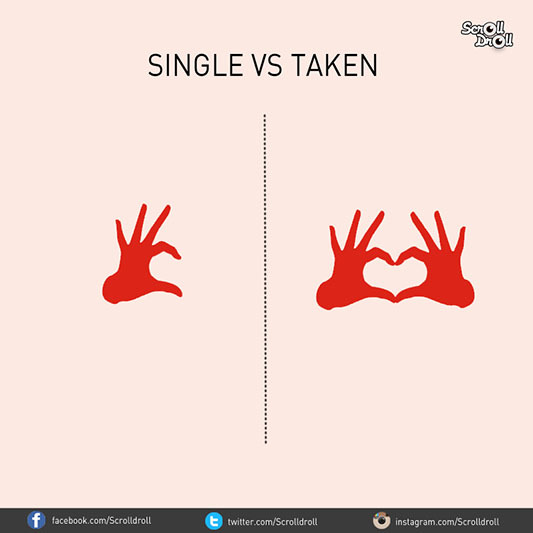 We’ve summed up the differences between your single and taken friends in these 10 awesome minimal posters. 1. 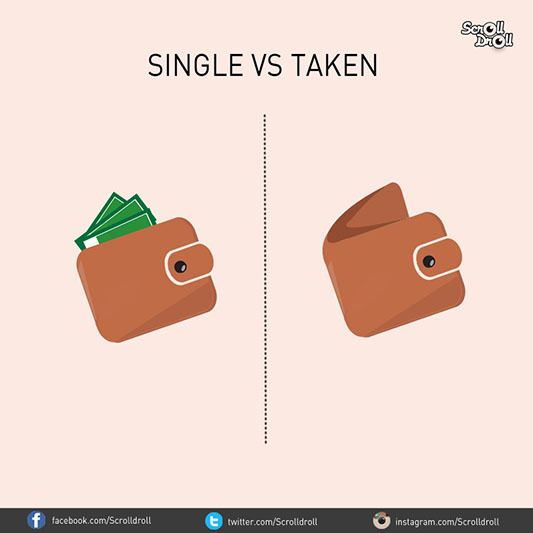 Love doesn’t come cheap – Dating is expensive business. All those movie nights and dinners don’t come for free. 2. 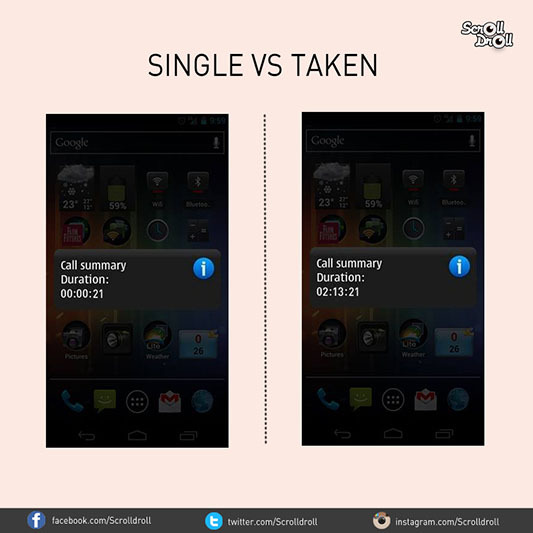 Those endless calls that go on all night – Thank God for unlimited calling plans! 3. Breaking the bro code – Single guys stick to the wolf pack, and taken guys, well they have their priorities all in one place. 4. 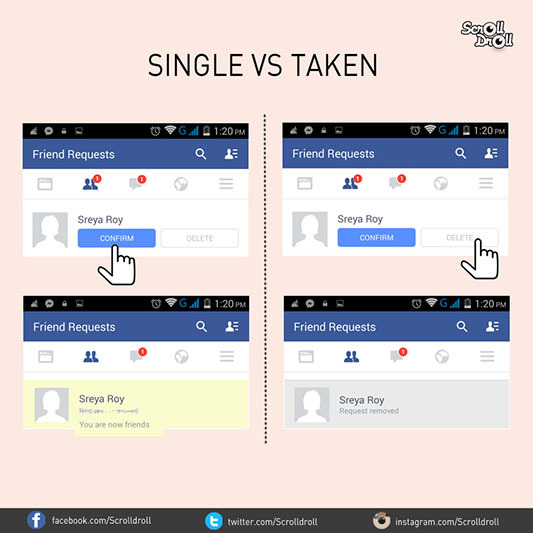 Social media sites are like landmines, waiting to explode – When you fear that accepting one friend request could land you in trouble, you’re definitely not single! 5. When you go to the movies with your gang v/s bae – Corner seats are for couples. Period. 6. Personal hygiene is kinda optional – When you have a girl, you gotta look and smell the part. Single guys can wear the same underwear all week, and not care. 7. 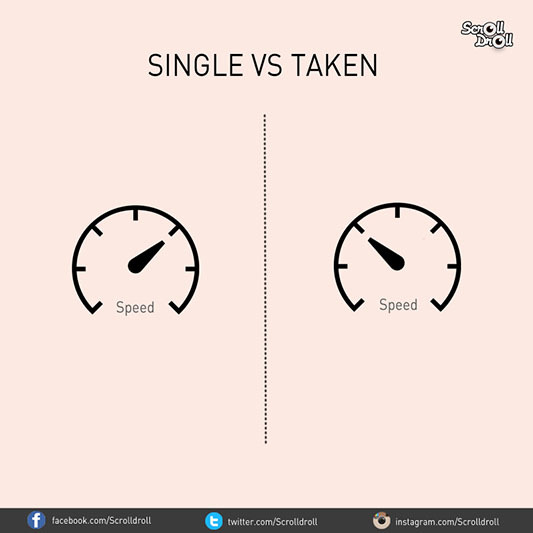 Fast and furious no more – You are taken when your speedometer needle is always tilted towards the left. 8. 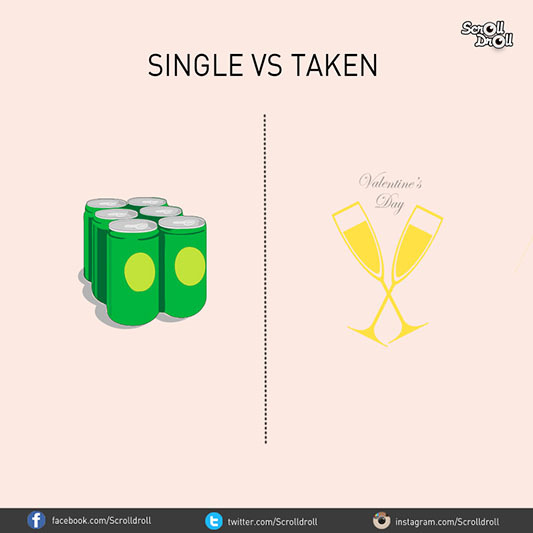 Beer isn’t near when you have someone dear – Your boy suddenly developed a taste for wine and champagne? He’s single no more! 9. 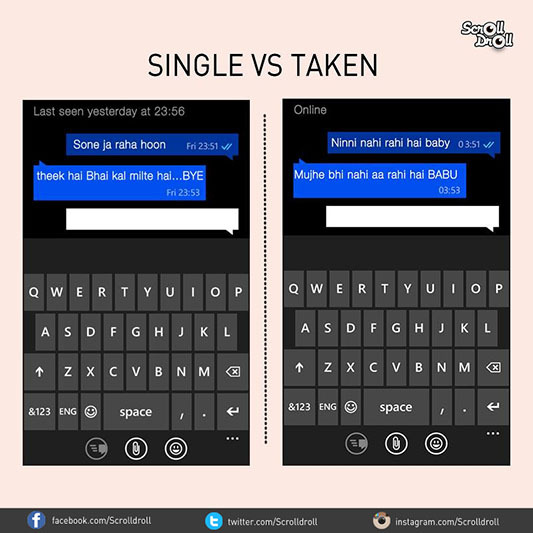 Conversations that make no sense but last forever – You are taken when you spend all day and night on WhatsApp, chatting away without having anything significant to say. 10. That feeling of being complete – At the end of the day, there’s a feeling of being complete if you’re taken while single guys (whether they admit or not) are always craving for someone to fall back to! Don’t forget to tag your taken friends on this to remind them of the good ol’ times!